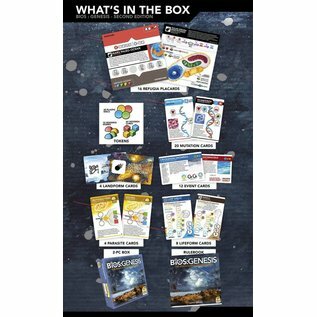 The Bios:Genesis Upgrade contain everything you need to play the game if you provide regular 6-sided dice and cubes+cylinders/domes in 4 colors. This upgrade kit is mostly for owners of Bios:Genesis 1st edition. It includes all the cards and components you need to economically convert your first edition Bios:Genesis into the 2nd edition.However, the Bios:Genesis Upgrade contain everything you need to play the game if you provide regular 6-sided dice and cubes+cylinders/domes in 4 colors. 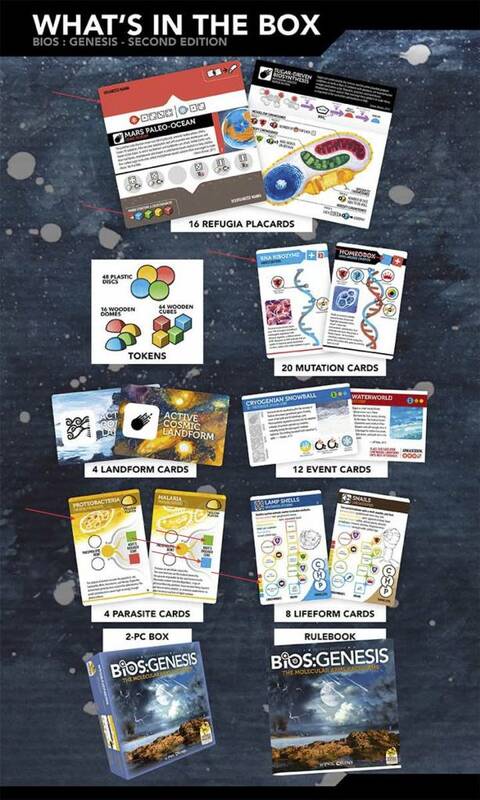 Bios Genesis UPGRADE comes with a new folding player aid, 16 Refugia placards, extra wooden domes for Bionts, 20 mutation cards with new artwork, 12 event cards with new artwork, 4 landform cards, 4 parasite cards, and 8 lifeform cards. It does NOT come with a box, wooden cubes, or plastic disks. Rules will be sent separately.